BEAUTY TRICK ! If you’re using an eyeliner pencil you probably have some issues making the perfect wing, right ? On the bright side, there’s a beauty trick that will be very useful and will make your life a whole lot easier. You won’t have to spend any money, all you will need is a spoon and that spoon can be used to apply your mascara too. It will maybe sound weird at first, but give it a shot and you will be happily surprised with the results. 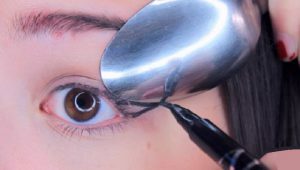 Obviously, you’re going to need a little bit of practise but afterwards you will become so good at making the perfect eyeliner wing.